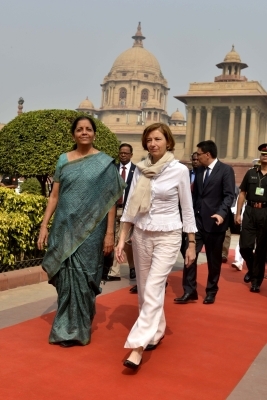 New Delhi, Oct 27 (IANS) India and France on Friday discussed ways to enhance defence cooperation, as Defence Minister Nirmala Sitharaman met her French counterpart Florence Parley in the national capital. According to sources, a slew of issues including the ongoing defence deals, as well as that for 36 Rafale fighter jets, industrial and technological partnership under the Make in India initiative, the regional security situation, including terrorism, and the overall global security scenario figured in the talks. Defence operational cooperation, specially in the field of maritime security, joint exercises of the armed forces, were among the issues in focus, at a time the Chinese Navy has been increasing its presence in the Indian Ocean Region. The possibility of another deal for additional 36 Rafale jets for India is expected to have featured in the talks, though there was no official confirmation. On Friday morning, Parley paid tributes at the Amar Jawan Jyoti at Indian Gate, and was accorded a Guard of Honour in the lawns of South Block, which homes the Defence Ministry. A statement from the French Embassy on Thursday called India the “foremost Asian strategic partner” and said the Minister’s visit was aimed at strengthening all aspects of France’s fast developing defence cooperation with India. Parley will be travelling to Nagpur on Friday evening, where she will participate in the foundation stone-laying ceremony of Dassault Reliance Aerospace Limited (DRAL) by its joint promoters, along with Reliance Group Chairman Anil Ambani and CMD – Dassault Aviation Eric Trappier. Minister of Road Transport and Highway Nitin Gadkari, and Maharashtra Chief Minister Devendra Fadnavis will also be present at the event. DRAL will be part of the upcoming Aerospace Park in Nagpur and plans to develop an indigenous value-added supply chain, thereby building a strong base for the success of the Rafale programme under the Make in India initiative. On Saturday, Parly will call on Prime Minister Narendra Modi for wide-ranging talks ahead of the State visit of President Emmanuel Macron. She will also meet National Security Advisor Ajit Doval. She would also visit the Mazagon Dock Shipbuilders Limited in Mumbai, were the Scorpene submarines are being made, and also visit the Western Naval Command. The Scorpene submarines are being built with transfer of technology under the P75 project by MDL, in collaboration with French shipbuilding major, Naval Group (formerly DCNS). She will also board the INS Kalvari, the first of the six Scorpene submarines to have been delivered to the Indian Navy.